How would you react if you heard a 600-lb patient was being admitted to your unit? Some healthcare professionals would feel anxious—perhaps because they’ve heard bariatric patients are challenging to care for, or they feel unprepared to provide their care. With the obesity epidemic showing no signs of abating, you’re likely to encounter bariatric patients at some point. How can you care for them with the dignity and respect they deserve? If we expect to conduct “business as usual” on our units, we’ll be caught off guard without the tools and knowledge we need to make the experience a positive one for the patient, family, and staff. 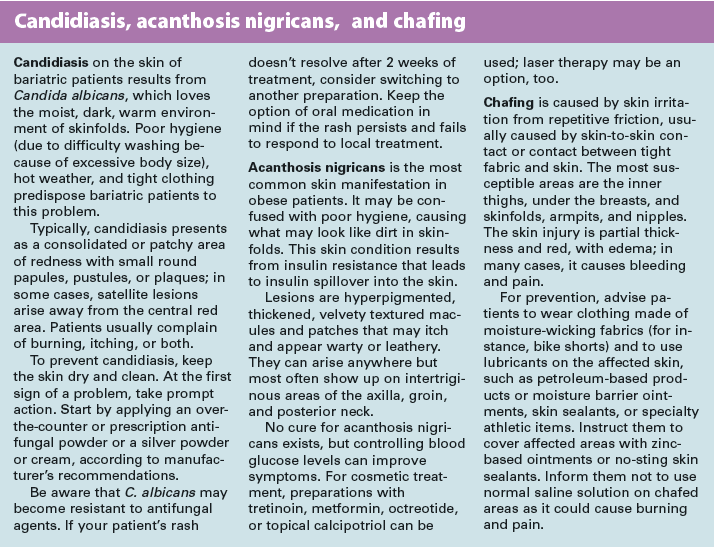 This article reviews how to prepare for and manage one of the most challenging aspects of caring for bariatric patients—providing skin care. Bariatrics is the branch of health care that specializes in treating people with obesity and associated conditions. Defined as a body mass index (BMI) over 30, obesity reflects how a person’s weight relates to height. Bariatric patients have an excessively large size, with excess adipose tissue under the skin and throughout the body. Use the word OBESE as a mnemonic tool to help you remember key clinical issues in bariatric skin management. O: Observe for atypical pressure ulcer development. B: Be knowledgeable about common skin conditions. E: Eliminate moisture on skin and in skinfolds. S: Be sensitive to the patient’s emotional distress. E: Use equipment to protect the skin and for safe patient handling. Observe for atypical pressure ulcer development. Bariatric patients are at higher risk for pressure ulcers, as their extra padding doesn’t necessarily protect them from the forces of pressure and shear. Although the data supporting higher risk for this population aren’t cut and dried, most expert clinicians believe the risk is higher, so be sure everyone knows that fat pads don’t provide protection. Also, bariatric patients commonly are malnourished and less mobile than others, making it hard for them to avoid excess pressure on the skin. Many have multiple comorbidities, such as diabetes, that further increase their pressure ulcer risk. We lack a risk assessment instrument specifically designed for this population, so we must use our clinical skills and experience to anticipate risk. In this population, pressure ulcers can develop in atypical and unique locations—hips, lower back, buttocks, in skinfolds, and in areas with medical devices, such as tubes. Also, foreign objects, such as medicine cups and TV remote controls, can get lost in the bed and lead to pressure areas. Bariatric patients require frequent turning and repositioning to help prevent breakdown from pressure and shear forces. Be knowledgeable about common skin conditions. Intertriginous dermatitis is an inflammatory skin condition commonly seen in the skinfolds of bariatric patients. It results from the weight of skin, which creates skin-on-skin contact coupled with friction forces and trapped moisture from perspiration. Dermatitis most often occurs in skinfolds behind the neck, under the arms and breasts, under the abdomen or pannus, on the side, and on the inner thigh. Eliminate moisture on skin and in skinfolds. skin contact, minimizing heat build-up on these tissues, and keeping the skin clean. Using absorbent materials can accomplish these goals. For instance, Interdry AG® Textile (from Coloplast, Inc.) is impregnated with ionic silver, which provides broad-spectrum antibacterial and antifungal action for up to 5 days. It’s designed to wick away moisture and reduce skin-to-skin friction. Clean the patient’s skin frequently with a pH-balanced cleanser, using gentle strokes to avoiding harming fragile tissues. Avoid scrubbing. Handheld showers and no-rinse cleansers can simplify this pro­cess. 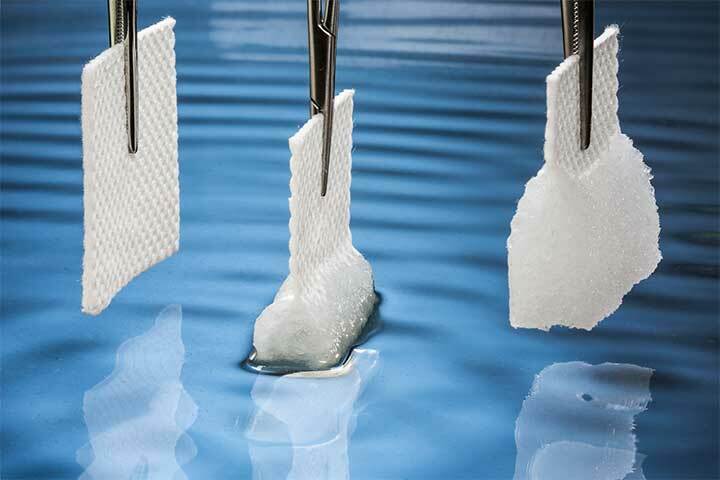 Advise patients to wear loose-fitting clothing made of absorbent fibers. Be sensitive to the patient’s emotional distress. Everyone involved in caring for bariatric patients should receive sensitivity training to increase their awareness and compassion. Many of us hold an unconscious negative view of these patients, which can manifest in our interactions with them. Bariatric patients have reported many incidents of unprofessional treatment by staff who are otherwise excellent caregivers but lack empathy and understanding. To make matters worse, bariatric patients frequently suffer from depression, altered self-esteem, and social isolation. Take care not to demonstrate prejudice through your actions and words, or to show reluctance to render care due to fear of injury, inadequate equipment, inadequate staffing, or a misunderstanding of obesity. Be aware of possible obesity bias. View: “Weight bias in healthcare,” from Yale Rudd Center. Use equipment to protect the skin and for safe patient handling. Equipment must be the proper size and construction to prevent rubbing and creating pressure points against the skin (for example, from the side panels of a too-small wheelchair). Reposition patients frequently to prevent skin breakdown; also, reposition any tubes and tube fixation devices. Use support surfaces of the appropriate weight limit to prevent bottoming out. 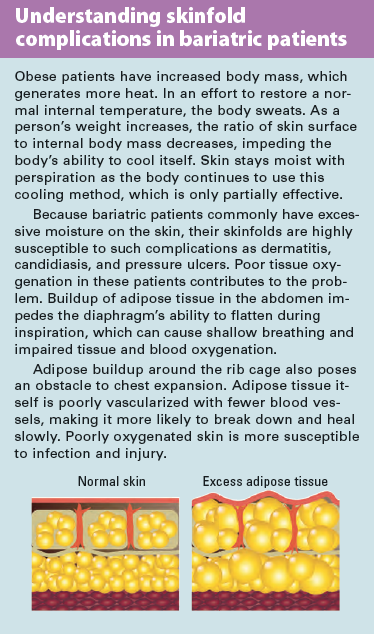 With skin moisture a common concern, most bariatric patients should use a low-air-loss mattress. Transferring and moving patients presents a hazard to both staff and patients. Ideally, healthcare facilities should have the proper equipment on hand and ready for use when the patient reaches the unit. The best way to ensure the right type and amount of equipment is to work with companies that specialize in safe patient-handling programs. 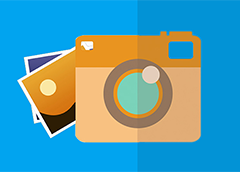 They can conduct a needs analysis and provide evidence-based recommendations that can be reviewed before equipment purchase or rental. Although facility administrators may believe they lack the budget for equipment purchase, I would advise them they don’t have the budget not to purchase it. A single lawsuit or injury claim by a patient or a workers compensation claim by staff can cost considerably more than the investment in proper patient-handling equipment. Specialized knowledge of common conditions and appropriate treatments can help us meet the challenge of caring for ba­ri­atric patients’ skin. That knowledge must be coupled with planning activities to address such issues as required staff, devices, and lifting and repositioning equipment. Accomplishing these goals long before you hear of a 600-lb patient on the way to your floor will greatly enhance the chance of a successful outcome. Beitz JM. Providing quality skin and wound care for the bariatric patient: an overview of clinical challenges. Ostomy Wound Manage. 2014;60(1):12-21. Black JM, Gray M, Bliss DZ, et al. MASD part 2: incontinence-associated dermatitis and intertriginous dermatitis: a consensus. J Wound Ostomy Continence Nurs. 2011;38(4):359-70. Blackett A, Gallagher S, Dugan S, et al. Caring for persons with bariatric health care issues: a primer for the WOC nurse. J Wound Ostomy Continence Nurs. 2011;38(2):133-8. Bryant RA. Types of skin damage and differential diagnosis. In: Bryant RA, Nix DP. Acute & Chronic Wounds: Current Management Concepts. 4th ed. St. Louis, MO: Mosby; 2012;83-105. Corbyn C, Rush A. 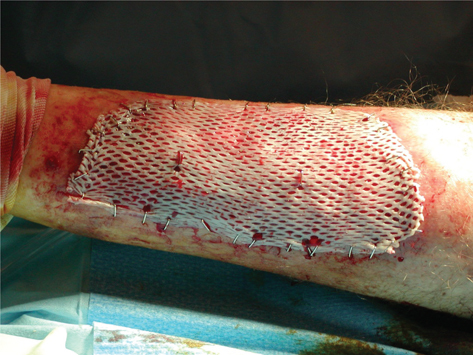 Challenges of wound management in bariatric patients. Wounds UK. 2010;6(4):62-71. Cuddigan JE, Baranoski S. Wounds in special populations: bariatrics. In: Baranoski S, Ayella EA, eds. Wound Care Essentials: Practice Principles. 3rd ed. Ambler, PA: Lippincott, Williams & Wilkins; 2012;542-51. Doughty D. Differential assessment of trunk wounds: pressure ulceration versus incontinence associated dermatitis versus intertriginous dermatitis. Ostomy Wound Manage. 2012;58(4):20-2. Doughty D, Junkin J, Kurz P, et al. Incontinence-associated dermatitis: consensus statements, evidence-based guidelines for prevention and treatment, and current challenges. J Wound Ostomy Continence Nurs. 2012;39(3):303-15. National Pressure Ulcer Advisory Panel, European Pressure Ulcer Advisory Panel and Pan Pacific Pressure Injury Alliance. Prevention and Treatment of Pressure Ulcers: Clinical Practice Guideline. Haesler E, ed. Osborne Park, Western Australia: Cambridge Media; 2014. Sardina D. Skin and Wound Management Course Workbook. Lake Geneva, WI: Wound Care Education Institute; April 2011. Zulkowski K. Diagnosing and treating moisture-associated skin damage. Adv Skin Wound Care. 2012; 25(5):231-6. Gail R. Hebert is a clinical instructor with the Wound Care Education Institute in Plainfield, Illinois.